Exotic Barn Finds: Lamborghini, Ferrari, Porsche, Aston Martin and More is a group of sports car restoration stories that will make you gasp. Imagine a rusted 1925 Bugatti Type 22 Brescia found at the bottom of a lake. It ends up being sold at auction for $360,000. That�s before any restoration is even implemented. True story. It�s in the book. Now imagine this same story repeating itself two dozen times. A 1953 Ferrari 212, a F5000/Can-Am Racer, a 1967 Lamborghini Miura. Treasured, timeless beauties � cars you�d give an arm to own � all discovered in obscure places like a parking lot. 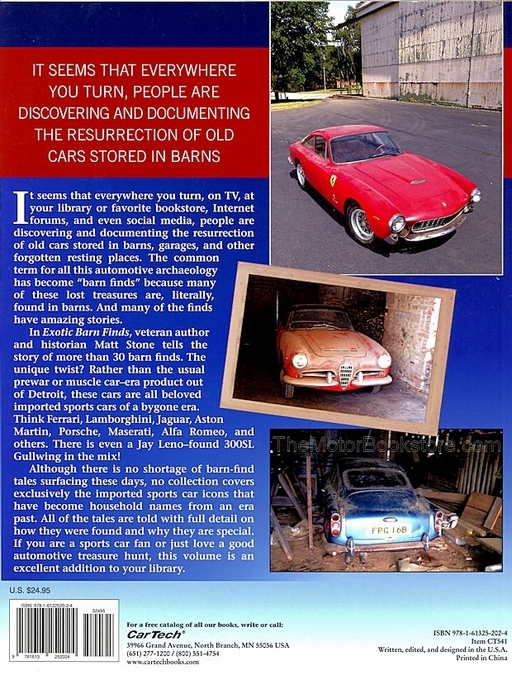 The author�s adventures covering sports car restoration stories began when he was 16. He and his father came across a �mountainous� stack of �hay, wire fencing, lumber, at least one mattress, and multiple layers of chicken droppings.� Removing the muck, they uncovered a 1954 Mercury Monterey hardtop. He figured this wasn�t the first time something like this had happened. What his investigations uncovered was not only how often it happened, but the rare and valuable vehicles found. Cars worth potentially hundreds of thousands discarded, forgotten and discovered haphazardly. 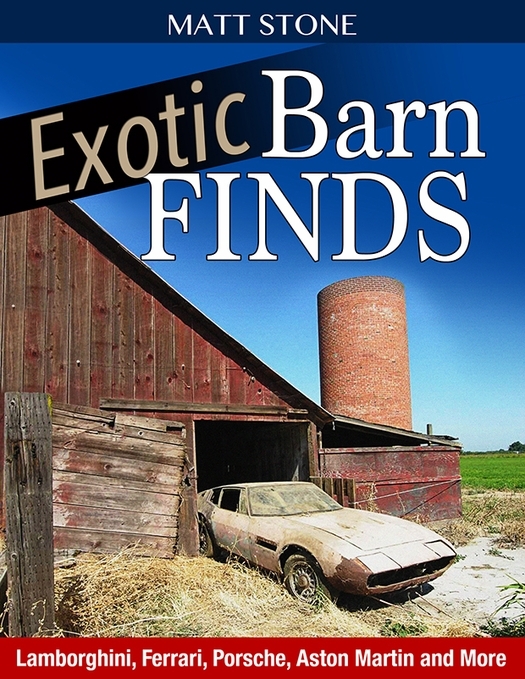 Each story in Exotic Barn Finds: Lamborghini, Ferrari, Porsche, Aston Martin and More is a detailed account of the car�s origins, owners, what happened to it before it was uncovered and what happened after. A 1955 Mercedes-Benz 300SL Gullwing, a 1958 Porsche 356A Speedster and a 1961 Aston Martin DB4, a total of 25 imported sports car restorations that will blow you away and give everyone a reason to take a second look at junk piles. Author Matt Stone is a freelance journalist, photographer, broadcaster and former editor. When he�s not investigating sports car restorations, hes looking for thrown away sports cars. He�s probably peeking in someone�s garage right now. 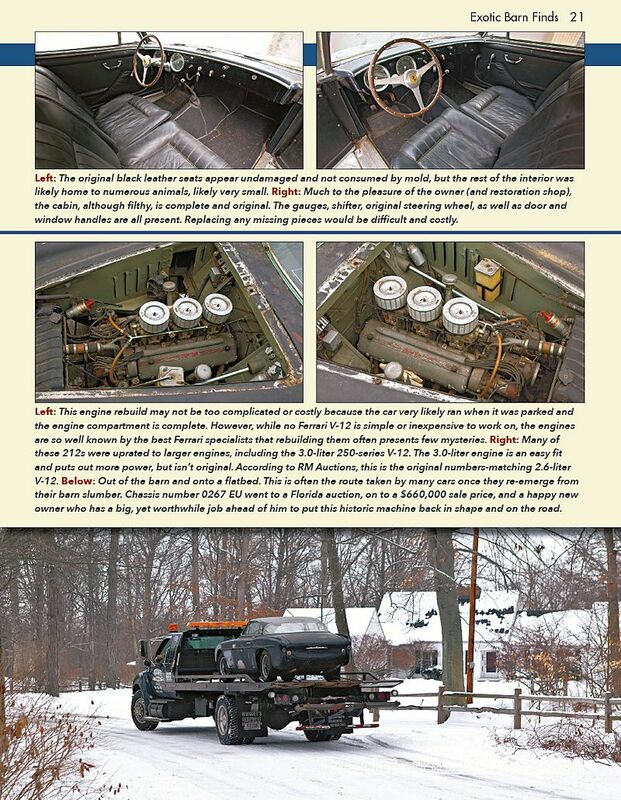 Below: Exotic Barn Finds: Lamborghini, Ferrari, Porsche, Aston Martin And More by Matt Stone Sample Page. Copyright CarTech Books. TABLE OF CONTENTS - Exotic Barn Finds: Lamborghini, Ferrari, Porsche, Aston Martin and More. Ask a question about Exotic Barn Finds: Lamborghini, Ferrari, Porsche, Aston Martin And More.